This goes back to the question of dose the load consume the ENERGY? The load cannot consume the energy because of the conventional proof energy cannot be created or destroyed. "Power" is not energy in to-tum; it is the amount transformed and directed to the load for useful "work". is right and if it is the bench will give the answer. There might be details not the same to built objects. The net energy (ie :power?) and the total energy are audit amounts for the energy audit. A proper device energy audit includes all losses and combined with possible gains. Energy is what sustains matter. Energy is in fact Synergy, that means 'which work with'. For instance in an atom, synergy represents the constant flow of energy that vaccuum, full of energy, constantly give to the atom to sustain its structure, which, as we now know, is vibration, aka energy as of our model of matter. This is coherent to maintain the structure of the atom which is the sine qua non condition for the natural equilibrium of the whole planetarium system, that of the atom , other of our Solar system. The synergy of a system in equilibrium must be constant. By our standards, however we have the ability to stretch that time out to something we can work with. We have at our disposal, length and permittivity. Energy in a system is = to the power it can deliver. So if we amplify energy... we can amplify power. Using the understanding of the sling shot. Each time we sling it . We gain. And this gain is in its self power amplification. Not voltage or current ... but both! "The primary source never delivers energy directly to a dissipated load, but rather to an energy storage system which then, over the second half the cycle, delivers its accumulated energy to the load at hand." Sling shot effect implies moving "points" for the lack of a better universal word... The first point is constant. But moving relative to the other. The "extra" energy seems to come from "know where." Becuse of yoir frame of refrance your mesuring at.. if you were on the moving constant... it would appear that it "came from nothing" .. However . If mesured from the outside of both points you would see the entire picture..
Then reseting for the next 1/2 cycle. More to studdy for sure. Russ is referring to the well-known technique of drafting a leading car, then just prior to contact, snapping to the side and "sling shotting" past. This technique works best during a turn where the increased angular momentum adds to the effect allowing a slower car to pass a car directly in front of him. The late Dale Earnhardt is noted as being the driver to utilize this technique successfully on several occasions. Also note, "timing is everything". PDF version of the text from Murray. extracted from the link posted on previous post. Piero, It seems that you would dive into those math's in Jim's work and get a good grasp of it. It seems that your math's are more advanced than Mine. i also think you already have a good grasp on similar concepts, so theses might help you advance even further. Murray was talking about solitons in that paper. That's a soliton beam for space propulsion. 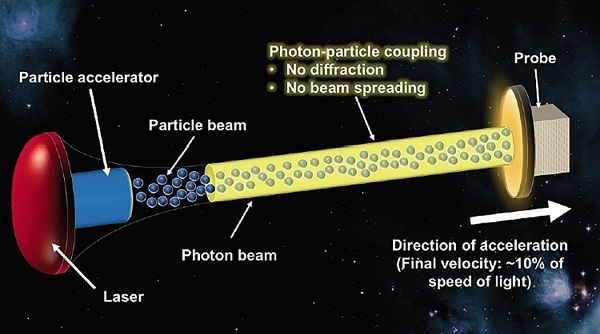 It combines a photon beam and neutral particle beam which combine to prevent beam-spreading via mutual interaction of the laser and particle beams so that refractive index variations produced by the particle beam generate a waveguide effect (thereby eliminating laser diffraction) and the particle beam is trapped in regions of high electric field strength near the center of the laser beam. It's known as PROCSIMA (Photon-particle Optically Coupled Soliton Interstellar Mission Accelerator. I can see why, if Murray was generating a soliton beam, he welded alligator clips together in another room and ruined his Minerva chronograph... with no beam-spreading, you can pack an incredible amount of energy into a very small profile beam, and it can go great distances. One point (planet) has enough mass to influence another point (satellite), which is a tiny fraction of the total planet mass, in a frictionless vacuum. Pluto, and similar mass to its moon, appear to be spinning together, sharing a center point of gravity, between two points. Different behavior with Earth and its moon's mass.